If Jungle Rumble: Freedom, Happiness and Bananas taught me anything, it's that cartoon monkeys are just as selfish as the people you meet in the real world. It seems like a simple compromise would have solved the monkey's problems and the entire adventure would be rendered pointless. Thankfully these simians refuse to get along, giving us a delightful (albeit flawed) new rhythm game for the PS Vita. 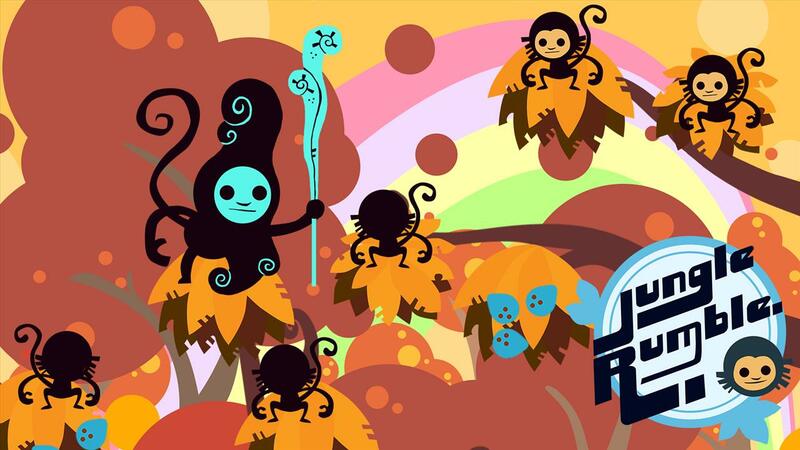 Similar to Sony's Patapon trilogy on PSP, Jungle Rumble sees players controlling a group of moneys by tapping the screen along with the rhythmic drumbeat. We start out moving the monkeys one branch at a time, and then later move on to pairing up the monkeys and even moving several branches in a single turn. But no matter what you want to do, it all comes down to keeping the beat and knowing the commands. For the most part, the goal of each stage is to climb the tree and capture the cluster of bananas from a gang of evil monkeys. Players can take out these nefarious primates by throwing coconuts. Like everything else, attacking is pulled off by using a specific tap pattern, all performed to the drumbeat. Not every level involves gathering bananas. There are some stages where the goal is to take the fight to the evil monkeys and defeat them before time runs out. There are other stages that move independently from the action, so you're forced to climb the tree whether you're ready or not. It's a cute idea that is mostly successful. Unfortunately, the cinemas teaching the mechanics aren't as clear as they need to be. In fact, there was one maneuver that, even after watching the tutorial a dozen times, didn't make sense. Eventually it all clicked, but not before suffering a lot of frustration. Although there are a lot of stages to complete, the action ended up being too repetitive for its own good. There are only a few commands and not much variation on the stage layout, so players will see the same sorts of challenges level after level. Some players may want to go back to earn gold medals on every stage, but it won't take long before you've had your fill of Jungle Rumble. And then there's the third act, which turns monkeys from lovable heroes to bloodthirsty serial killers. It's a surprise turn that will surely go down as one of the most shocking finales of 2015. And while I don't morally object to the direction it takes, I found that the twist made me dislike a cast of characters I'm supposed to be rooting for. Visually, Jungle Rumble stands out for a couple of reasons. For one thing, it has a sharp cartoon aesthetic that really shines on the PS Vita's screen. More importantly, this is one of the very few games that makes you hold the Vita vertically. Considering we're constantly moving up a tall tree, the change in perspective makes a lot of sense. Unfortunately, it feels a little awkward and it's not the preferable way to hold Sony's handheld. 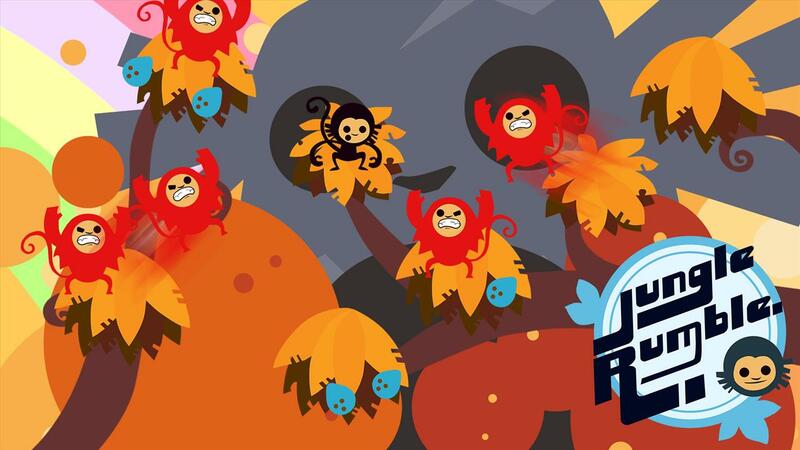 Despite some of the problems, Jungle Rumble feels like a tech demo of a much deeper game. With a few more commands and variety in the stages, I could see this being an addictive little rhythm game. Sadly, too many levels play out the same way and the story doesn't pick up until the very end. I still say that this whole thing could have been worked out with a little compromise on everybody's part. 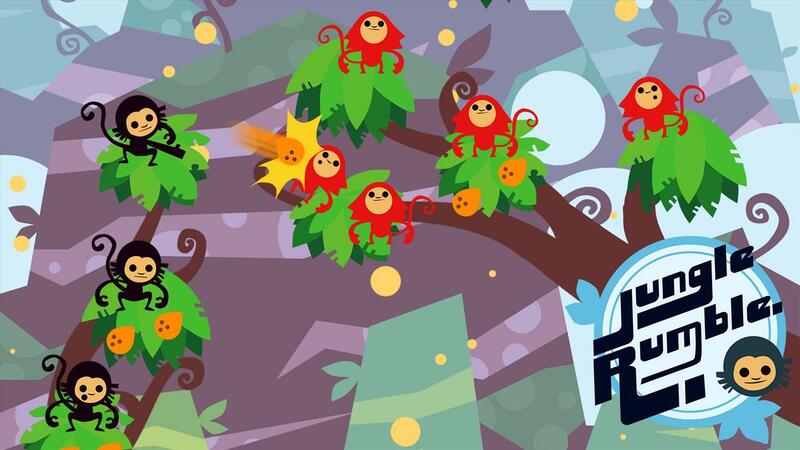 A cute concept is not enough to save Jungle Rumble: Freedom, Happiness and Bananas from being a disappointing rhythm-action game. Tapping the screen is fun at first, but too many of the levels play out the same way, and the whole ordeal becomes too repetitive for its own good.